Finally! It is high time that I review these brushes! I've had this set for one year already and I think that year gave me enough time to properly see the pros and cons of these brushes. I have written in my previous review about Real Techniques Core Collection that these brushes were designed by Samantha Chapman - a makeup artist and the other half of the famous Youtube channel Pixiwoo. Like what I said before, the brushes from Real Techniques come in different colors and they are coded as Gold - for a flawless base, Pink - for a perfect finish and lastly Purple - for enhanced eyes. 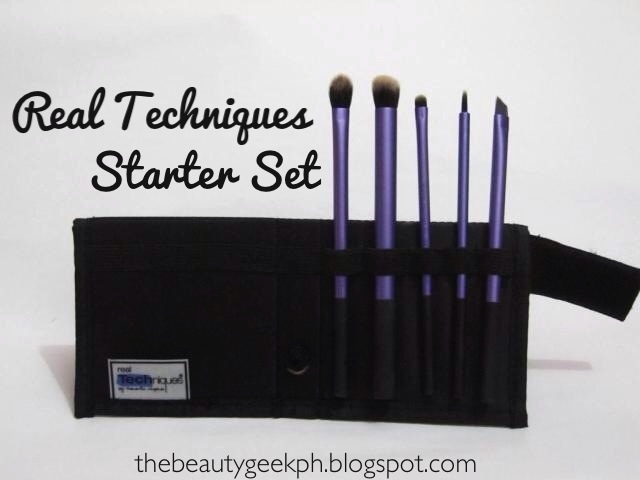 The starter set has 5 brushes meant to create perfect eye makeup - hence the purple handles. The 5 brushes are mainly the Deluxe Crease Brush, Base Shadow Brush, Brow Brush, Pixel Point Eyeliner Brush and an Accent Brush which I will individually write about today. The set also includes a panoramic case. You can buy directly from Real Techniques. I had my friend buy this set for me at ULTA, it is also available at Boots in the US. However, here in the Philippines, shipping may be a bit costly. You may be able to buy these brushes at online stores, only, they are a bit pricier than how it originally costs. But, that is a reasonable price since the shipping fee here would cost you more if you buy directly from the site anyway. Most online stores sell this for P1500, the cheapest I found was from a trusted seller at Facebook: Carefree Shopper (just click the link it will direct you to their Facebook Page). Carefree Shopper sells them for P1150 per set - definitely NOT as overpriced as others right? Again, like the Core Collection, the Starter Set is encased in a velcro, toggle - then fold over holders. I find this very innovative, as it can be folded back to use as a stand, or you can loosen the toggle to close and use the stand to hold the brushes when you travel. Not like any brush roll huh? Now let us talk about these brushes individually! This is my favorite among the rest of the brushes from this set. Although it is originally intended to be used as a crease brush - I use it for another purpose since my eyes are too small and this brush is to big to be used in the crease area. 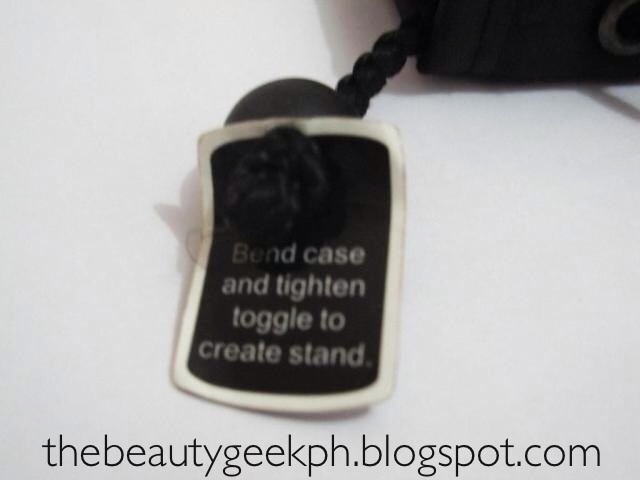 This is helpful though in setting my concealer. I use it with my Ben Nye Banana Powder or my RCMA colorless powder when I set my concealer. It is also great in using cream based concealer. It gives out a fine and smooth look - not streaky and thick like flat concealer brushes do. This one is a tapered brush which is a 'bit' flat. It works well in pressing eyeshadow pigments in my eyes but I still find it a wee bit flimsy compared to my other eye shadow brushes who are more flat. It works better though when you blend your eye makeup or when you wish to soften up harsh lines. I actually hated this brush at first because I was used to stiff eyebrow brushes and this one was softer. It has been one of my favorites up to date though, since it is soft enough to give your eyebrows a light color that would fill in the gaps, thus making it appear more natural instead of the look that is too stenciled and harsh. 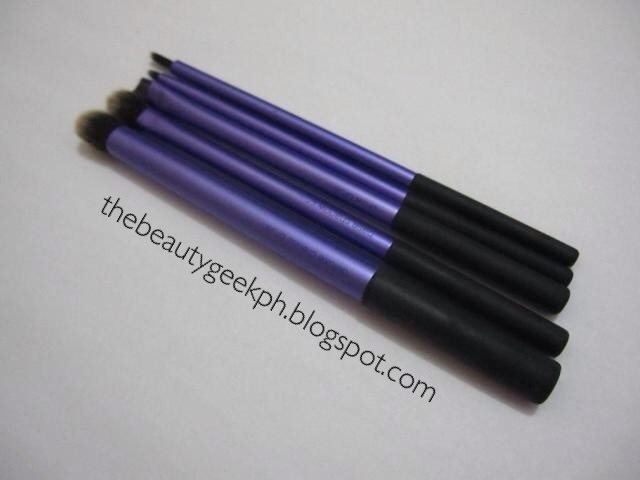 It can also be used as an eyeliner brush, especially if you want to do a winged liner. Also, this may be used as a lip brush. I use this brush the lease. I find it too fat to be an eyeliner brush. Maybe if I am going for a mod look, this may ease up the application for eyeliner. The one sold individually is thinner than this though. I still can't find another good use for this. Lastly the accent brush, which is one of my favorites too. I use this often in highlighting the inner corners of my eyes. This is also helpful on your water line. In all honesty, I wasn't as psyched as I was on this Set compared with my Core Collection. There were good brushes which were a part of this and then there were those who are just comparable with the eye brushes I have which were purchased locally. It is a good start up brush kit though for beginners, but if you have many brushes with the same function, I wouldn't recommend this one as a 'must have'. It is still a great value for your money, considering you get five brushes for a price that isn't so steep. I don't regret having this set though because it has all the eye brushes that I need when I travel. Have you tried Real Techniques Brushes already? What are your favorites? I like using the eyeliner for lining with an eyeshadow, works well, especially when wet and with minerals. I also might use it for defining the outer V or to "cut crease". Love this! This may help some of you, you can get the full range of real technique brushes at iherb.com really cheap, and i have a code for upto $10 off! : HWT011 :use it at the checkout and only $4/ £2.50 worldwide delivery!!! Hope this helps, they end up being like super cheap! :) . Loved your review. Keep up the good work. I really had a great time reading your blog and I found it more interesting. Like you my one of my addiction is to collect makeup brush set with a lot of colors. 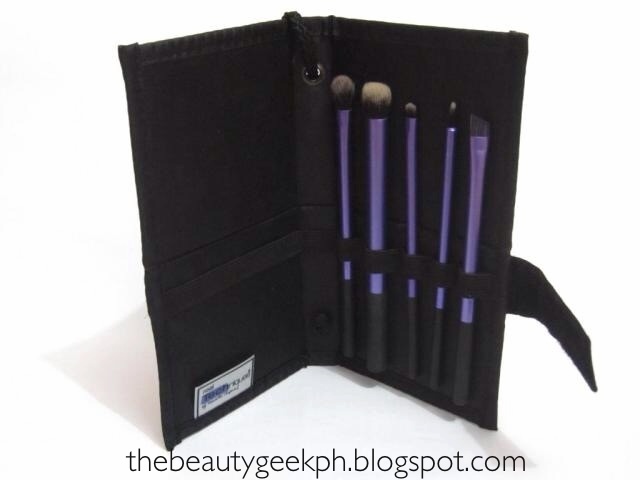 I have my favorite beauty online store that offers affordable makeup brush set. Feel free to visit their website here: http://blushies.com/ if you're interested.